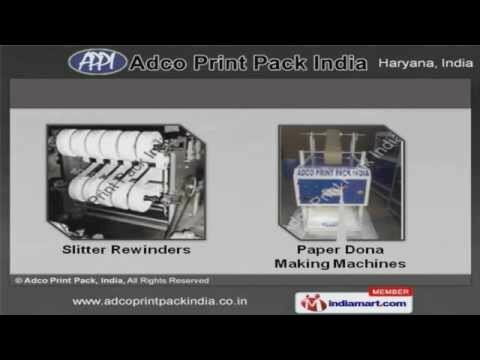 Welcome to Adco Print Pack, India. Manufacturer & Exporter of Paper Cup & Paper Plate Machines. An ISO 9001:2008 certified company, established in the year 2002, at Faridabad. OurModern infrastructure helps us to Cater to Australia, America, Indian Subcontinent &other countries. Large production capacity, strict adherence quality & Total customer satisfaction makeus the first choice of our clients. We offer a huge gamut of Paper Bowl Forming, Cup Making & Plate Making Machines. Our Screen Printing Equipments, Packing & Disposable Utensils Making Machines arewidely appreciated in the market. We offer Lamination, Roll Cutting & Automatic Bag Making Machines that are wellknown for their functionality. We also provide Roll Punching & Sheet Cutting Machines that are a class apart. Slitter Rewinders & Paper Dona Making Machines offered by us are cost effective. Along with that we offer Die Making Machines & Paper Utensils Making Materials thatare best in the industry.